A more cautious investors’ approach to arranging additional new vessel capacity has been a notable feature of global shipping markets in the past few years. Since orders for newbuildings collapsed to a small volume three years ago there has been a revival. But contracting remains relatively subdued, especially when compared with the capacity of the existing fleet. What does this pattern reveal about shipowners’ attitudes to future freight and asset market prospects? Greater scepticism about future good investment returns has unfolded. Signs point to further, possibly lengthy, adjustments needed to correct freight market imbalances and gain sustainable reductions in ship demand/supply gaps. Limits on new capacity joining the fleet, resulting from restrained newbuilding orders, is a means of achieving this outcome. Circumstances in individual market sectors vary, but there are common influences. The fleet proportion comprised of older or potentially obsolete vessels and what is implied about scope for replacements is one aspect. Another is the outlook for seaborne trade and ship demand growth and, if expansion is envisaged, how much is foreseeable. The trade view adopted provides indications of additional ship capacity which may be required. Trends in annual newbuilding orders placed during the recent period and preceding years are highlighted in the chart. Cyclical peaks and troughs since 2000 are shown for world merchant fleet orders, and the contributions of the main vessel type categories. An exceptionally high peak reached in 2007 at the end of the long freight market boom is prominent. Further high peaks were seen in 2010, and again in 2013 after which there was a downturn to a low point in 2016. The past two years have seen a recovery. More disciplined, or orderly, ordering strategies have evolved over the past few years, although in some sectors and for varying durations observers questioned whether restraint was proving well entrenched. Larger vessel categories in particular were popular with investors. In the past three years favoured vessel types subject to temporary ordering surges included the very large crude carrier (vlcc), very large ore carrier (vloc), and very large container ship (vlbc). Other investments proving attractive at certain times during this period included aframax tankers, kamsarmax bulk carriers, liquefied natural gas (lng) carriers and mega-size cruise ships. 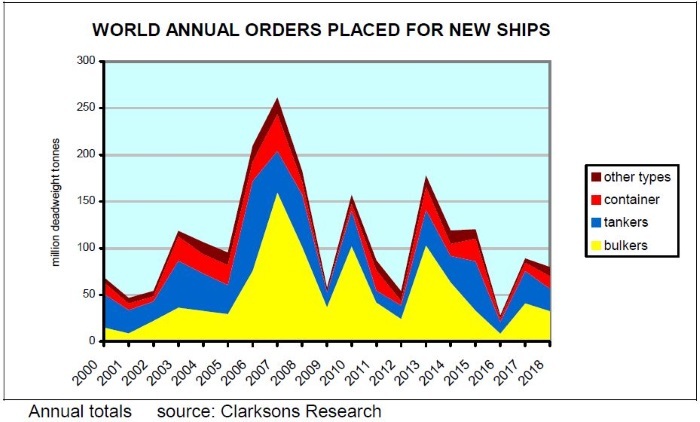 Figures calculated in deadweight tonnes by Clarksons Research show new orders for all commercial ship types, placed at shipbuilding yards worldwide, totalling just under 80 million dwt in 2018, a figure which probably will be revised. This provisional total is about 10 percent below the 2017 volume of 89m dwt. Both totals were much higher than the decade’s low-point seen in 2016, when only 28m dwt was recorded. Looking at last year’s pattern in more detail, new orders for bulk carriers and tankers comprised 41 percent and 30 percent respectively of all orders placed (based on deadweight tonnes). This new contracting was substantially below that seen in the preceding year. Partly offsetting these downturns – and providing enhanced value activity for shipbuilders because of higher proportional work content – was the greatly increased contracting for container ships and gas carriers. How will the 2018 orders, augmenting accumulated previous orders, affect newbuilding deliveries (completed ship volumes) over the next few years? In the immediate future, 2019 and into 2020, most newbuilding vessels delivered and becoming operational will result from contracts placed well before last year, in 2017 and earlier. This long interval between ordering and completion of construction, with delivery to a shipowner, reflects the fairly typical size and length of orderbooks at many shipbuilding yards. Actual building work is often started long after the order contract has been agreed, and delivery is frequently up to two or three years after the order date. Sometimes the feature is described as the order ‘backlog’. In some cases later completion reflects complicated vessel construction, over a more extended period than is usual for standard fairly basic ship types. 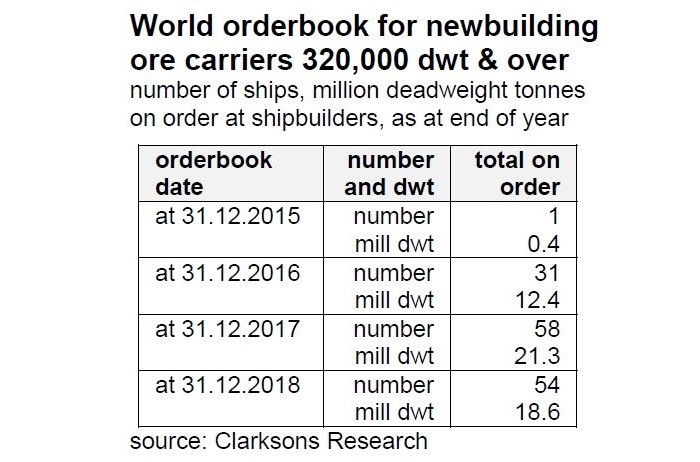 At the end of 2018, the entire world orderbook for all ship types together totalled 212m dwt, equivalent to about 11 percent of the existing 1,974m dwt fleet, according to Clarksons Research data. Over the twelve months since the previous year-end, the orderbook total had decreased by 7m dwt or 3 percent from 219m dwt, with deliveries during the period at a level very similar to the incoming new orders volume. Among the main ship types there was remarkable uniformity, at the 2018 year-end, in orderbooks as a percentage of the existing fleets. The tanker, bulk carrier and container ship orderbooks were in line with the average, within a 10-12 percent range. By contrast, the orderbook for LNG carriers was equivalent to 25 percent of current fleet capacity. The potential impact of orderbooks on future fleet capacity can be gauged by looking at the scheduled dates for newbuilding deliveries. Typically at any given point the largest proportion of an orderbook is scheduled for delivery in the next one to two years. A much lower volume three years ahead is usually a feature, but volumes two or more years ahead are likely to be raised, perhaps greatly as more new orders are placed during the lead-up period. Newbuilding delivery schedules are only a rough guide to what might be actually delivered. Order book ‘slippage’ is a well-known phenomenon. There are numerous explanations for order delivery date modifications, including formally agreed postponement, although these are not always reported clearly. Analysts try to estimate the proportion of the scheduled newbuilding deliveries which will not be delivered during any specific period, but there is much guesswork involved in this process and results often prove substantially inaccurate. In 2018 recorded deliveries of newbuildings (all ship types together) totalled 80m dwt, a sharp reduction of almost one-fifth from the previous year’s volume. Results varied among sectors. Tankers and bulk carriers saw similar declines: a 26 percent fall in tanker deliveries to 28m dwt was accompanied by a 27 percent fall in bulk carrier deliveries also coincidentally to 28m dwt. By contrast, the container ships segment saw a 9 percent increase to 14m dwt, while in the smaller LNG carriers category the newbuilding deliveries volume surged, rising by 85 percent. Compared with this picture of actual capacity added last year, scheduled deliveries of orders for all ship types suggest that capacity added in 2019 may not change greatly. The total could remain at around 80m dwt, although that is a tentative estimate. At the start of this year, totals for scheduled newbuildings in 2019 as a whole showed higher figures than delivered last year for tankers and bulk carriers, but lower figures for container ships and LNG carriers. Adjustments for possible delayed completions reduce the scheduled delivery volumes. It seems likely that in 2019 both tanker and bulk carrier deliveries will be around 15-20 percent higher than seen last year, while container ship deliveries could fall by 35 percent and LNG carrier deliveries fall by 40 percent or more. Estimates for new capacity additions further ahead are more speculative. There is still potential for many new orders to be added to the schedules for 2020 and later years, but the scale is difficult to predict. 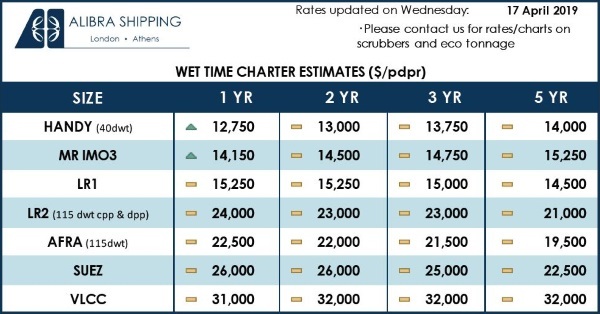 Relatively low newbuilding prices at shipbuilding yards are an attractive incentive for a shipowner to order new tonnage. However, financing options have become more restricted. Also, in several market sectors, much uncertainty prevails about longer-term prospects for global trade and vessel demand, while the impact of changes in regulations and technology is unclear. These imponderables act as a heavy restraint on decisions to order new ships. Insights into how future markets are expected to evolve, and potential for participation are revealed by the nationality of shipowners making large investments in new ships. Differences in national attitudes towards preferred activities and prospective financial returns are reflected in newbuilding orders. During 2018 overall global investment into new ships was slightly below the previous year’s total at $67 billion based on contract value, as calculated by Clarksons Research, a 3 percent decrease. The five largest investing nations were (in order of value invested) Greece, Japan, USA, China and South Korea, together investing $37bn, well over half of the total. While China and USA saw annual reductions, the other three saw increases. Greece was at the forefront last year with $10.2bn invested in newbuildings, almost double the amount recorded in the preceding twelve months and by far the highest national total seen since four years previously. A large three-fifths proportion of last year’s investment comprised LNG carriers, a market in which Greek owners saw attractive opportunities. Owners in Japan identified container ships as a good proposition, committing one-third of the national $8.1bn investment total. In the United States owners invested $7.6bn, with an emphasis on high-value cruise ships. Newbuildings investment by shipowners in China during 2018 was about one-quarter lower than seen in the previous twelve months, at $5.8bn. By contrast, South Korea’s owners raised their total by almost a half, to $4.9bn. Among other, smaller, investing nations there were some notable changes. Germany experienced a sharp recovery to $4.0bn after two years of depressed investment, while there was a similar sequence in Taiwan where the annual total rose to $2.5bn. By contrast, Italy’s $2.2bn was a huge reduction to only about one quarter of the previous year’s very high level. As emphasised by the graph, during the past two years merchant ship newbuilding order volumes recovered from a very low point. Although the provisional 2018 total was below the previous year’s figure, both past two years saw much higher totals than recorded in 2016. Additional ordering of several vessel types contributed, but renewed interest in bulk carriers was one main reason and, in particular the ‘capesize’ segment featured. The capesize segment is normally defined for statistical purposes as bulk carriers of 100,000 dwt and over, a very broad size group. 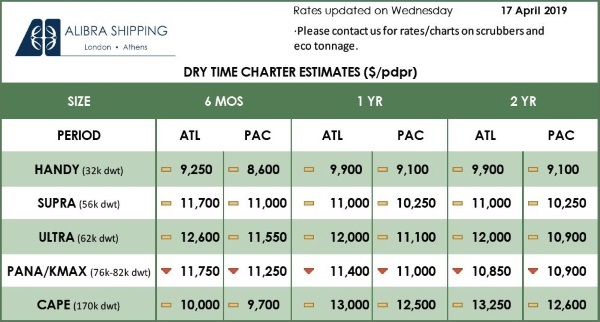 Typical capesize vessels have about 180,000 dwt capacity, but substantial ordering action in the past couple of years has evolved in a sub-group of bigger ships. Numerous orders were ultra-large capacity units, especially a specialised type known as a very large ore carrier (vloc) in the 300-400,000 dwt range. After falling to 6.4m dwt in 2016, half the previous year’s volume, newbuilding orders for all bulk carriers in the capesize (100,000 dwt and over) size group placed in 2017 jumped to 21.6m dwt. This high level was followed last year by contracts totalling 18.3m dwt. The huge 2017 total included 32 vlocs of 325,000 dwt or larger, after which there was a reduction to 12 units in this sub-category in 2018. As shown by the table, new orders greatly boosted the orderbook for vlocs and it has remained high, with 54 on order at the end of 2018, including 19 scheduled for delivery this year. A specific explanation for many vloc orders is apparent. Bulk carrier newbuilding orders are not always linked as direct replacements for older existing ships intended to be scrapped fairly soon after the new ships are delivered. Demolition decisions are often more flexible, depending greatly on how the freight market performs over a period ahead, not usually a predictable influence. But for a large number of vloc newbuildings, there is a direct relationship with existing vessel obsolescence and replacement. Within the current fleet a sizeable group of relatively old ore carriers in the 260-310,000 dwt capacity range is still operating. These vessels, originally built as single-hull tankers, were phased-out of the tanker fleet under International Maritime Organisation rules stipulating double-hull vessels. Conversion into ore carriers was completed up to ten years ago, extending the lifespan of ships originally constructed in the first half 1990s. Such ore carriers are reaching or exceeding 25 years service, around the maximum lifespan, and are set to be replaced by the new vlocs being delivered in the next couple of years. Shipowners’ self-disciplined ordering of new vessel capacity is a crucial ingredient in the market rebalancing process. Maritime history has provided numerous instances of shipping cycles adversely affected by excessive fleet expansion. Owners collectively are often criticised for over-ordering. But most criticisms come from pundits who are not required to make difficult investment decisions based on unpredictable future events, and who are not penalised for making incorrect forecasts of global trade growth and other imponderables. Currently, as a broad generalisation, shipping investors’ collective restraint in placing new orders is proving a prominent beneficial influence towards restoring profitability. Despite historically attractive prices and finance available for shipbuilding transactions in many cases, a large proportion of owners have adopted a cautious attitude, avoiding over-optimism about markets. This feature is likely to prove advantageous in contributing to freight market rates which are well supported, on a sustained basis, over an extended period of time. Other contributions will be needed. On the ‘supply side’ of the picture, another influence determining fleet growth is scrapping activity, required at a sufficiently high level. In future years new global regulations being introduced under IMO agreements are likely to affect shipowning economics. Large-scale capital investment necessary to comply with new rules may prove unjustifiable, especially when a ship’s remaining life expectancy is limited. This influence could hasten the pattern of sales for demolition. One of the new regulations requires installation of ballast water management systems in existing ships, to be phased in over several years beginning later this year (new-built ships already are required to comply). These systems entail significant capital spending and technical problems can arise. This rule will start having an impact soon. Potentially a much greater impact will occur when the maximum allowable sulphur content of fuel used on international voyages is reduced for the entire world fleet of ships, to 0.5% (from 3.5%) on 1 January next year, often known as the 2020 fuel sulphur cap. Compliance can be achieved by installing an exhaust gas cleaning system or scrubber, involving substantial spending as well as loss of earnings during installation. In some cases it is expected that tightening regulations will result in ships being scrapped earlier than might have been seen previously. On the ‘demand side’ of the picture, a sufficiently buoyant global seaborne trade trend is needed to achieve a balanced freight market. Expectations among market players for longer term trade growth have become more conservative in the past couple of years, as restraints on world economic activity and import demand became clearly visible. Variations among commodities are evident, with some still likely to see rapid advances, but a slackening broad trend is widely foreseen, with implications for capacity expansion in the world fleet of merchant ships. Investors’ caution in buying new ships consequently seems justified. Although shipbuilding capacity globally is available for a faster new construction pace, and there are incentives for investors to participate, currently there are no signs of a return to the pattern of ordering sprees seen in the past, and ordering activity remains ‘under control’, at least for the time being.